This map shows details of the Aleutian arc not visible in an earlier publication. The Aleutian arc extends about 3,000 km from the Gulf of Alaska to the Kamchatka Peninsula. It marks the region where the Pacific plate subducts into the mantle beneath the North America plate. This subduction is responsible for the generation of the Aleutian Islands and the deep offshore Aleutian Trench. Relative to a fixed North America plate, the Pacific plate is moving northwest at a rate that increases from about 55 mm per year at the arc's eastern edge to 75 mm per year near its western terminus. In the east, the convergence of the plates is nearly perpendicular to the plate boundary. However, because of the boundary's curvature, as one travels westward along the arc, the subduction becomes more and more oblique to the boundary until the relative plate motion becomes parallel to the arc at the Near Islands near its western edge. Subduction zones such as the Aleutian arc are geologically complex and produce numerous earthquakes from multiple sources. Deformation of the overriding North America plate generates shallow crustal earthquakes, whereas slip at the interface of the plates generates interplate earthquakes that extend from near the base of the trench to depths of 40 to 60 km. At greater depths, Aleutian arc earthquakes occur within the subducting Pacific plate and can reach depths of 300 km. Since 1900, six great earthquakes have occurred along the Aleutian Trench, Alaska Peninsula, and Gulf of Alaska: M8.4 1906 Rat Islands; M8.6 1938 Shumagin Islands; M8.6 1946 Unimak Island; M8.6 1957 Andreanof Islands; M9.2 1964 Prince William Sound; and M8.7 1965 Rat Islands. Several relevant tectonic elements (plate boundaries and active volcanoes) provide a context for the seismicity presented on the main map panel. The plate boundaries are most accurate along the axis of the Aleutian Trench and more diffuse or speculative in extreme northeastern Russia. The active volcanoes parallel the Aleutian Trench from the Gulf of Alaska to the Rat Islands. 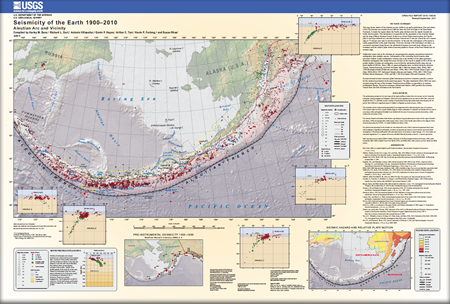 Benz, H.M., Dart, R.L., Villaseñor, Antonio, Hayes, G.P., Tarr, A.C., Furlong, K.P., and Rhea, Susan, 2011, Seismicity of the Earth 1900–2010 Aleutian arc and vicinity: U.S. Geological Survey Open-File Report 2010–1083-B, scale 1:5,000,000.